In many ways Andre Rison is representative of the typical elite wide receiver; he was gifted with incredible talent but allowed his personality and off the field antics get in the way of his performance on the field. 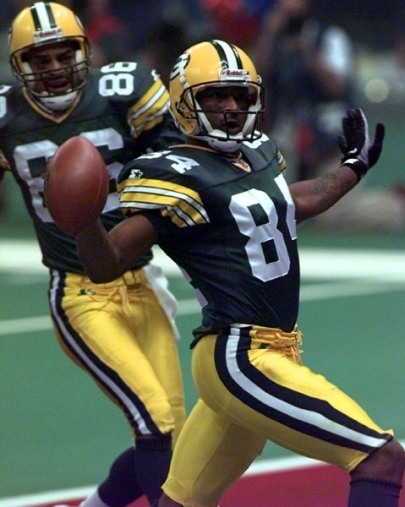 Had Rison put everything he had into the game like hall of fame receiver Jerry Rice is possible that we would be talking about Andre Rison, not Jerry Rice, as the best receiver to play the game. Rison’s career in the NFL can only be described as a roller coaster, littered with ups and downs. At time in his career he looked virtually unstoppable, while at others he looked like he would rather be doing anything else other than playing football. Andre Rison has always been considered a star receiver, even dating back to his days at Flint Northwestern High School and he carried that reputation with him to Michigan State University. As the 1989 NFL draft rolled around Andre Rison had not yet earned a reputation for being a trouble maker on and off the field so he was a highly regarded talent by most teams, a fact which led him to be selected by the Indianapolis Colts with the 22nd pick in the first round of the draft. In his rookie year with the Colts Rison showed everyone around him why he should b considered an elite talent in the NFL as he dominated his way to 52 catches for 820 yards and 4 touchdowns; it wasn’t the best rookie performance by a wide receiver by any means, but it was still impressive none the less. After his rookie showing Rison’s value increased dramatically and he was eventually traded to the Atlanta Falcons as part of a deal that sent the first pick in the draft to the Colts, which they used to select quarterback Jeff George. Unbeknownst to Rison, his time in Atlanta would be the most productive of his career; it would also be the longest time he spent with any one team. In his first season in Atlanta, which was just his second in the NFL, Andre Rison racked up an impressive 82 catches for 1,208 yards and 10 touchdowns, a performance which earned him his first Pro Bowl selection. The following year Rison had one less catch than he did in 1990 but his yardage total dropped more than 200 yards, though he did manage to increase his career high touchdown mark to 12 while earning a second consecutive Pro Bowl appearance. In 1992 Andre Rison caught a career high 93 passes, a mark that would stand for the rest of his career, while also tallying 1,119 yards and 11 touchdowns through the air. In 1993, arguably Rison’s best season in the NFL, the fifth year receiver led the league in touchdowns with 15 while also establishing a career high of 1,242 yards in a season and making his fourth consecutive appearance in the Pro Bowl. The following year Andre Rison had another 80 catch 1,000 yard season in Atlanta, giving him four such seasons in just 6 years. After the 94′ season Andre Rison hit free agency and instead of staying in Atlanta he signed a substantial contract with the Cleveland Browns, making him one of the highest paid receivers in the league. Unfortunately for Andre Rison and the Cleveland Browns big money didn’t translate into big success as Rison spent 1995 going through the motions and recording career lows in yards, catches and touchdowns. Thanks in large part to his underwhelming performance in 1994, as well as his criticism of the team’s fans, Rison did not stay with the team when it moved to Baltimore in 1996. Rison initially spent the first portion of the 96′ season with the Jacksonville Jaguars before being traded to Green Bay for the last 5 games of the season, ultimately helping them to win their first Super Bowl since the 1960’s. Andre Rison would go on to spend the next three years in Kansas City, where he would somewhat return to form in 1997 but collapsed again the following two seasons. Andre Rison spend the 200 season, his last in the NFL, with the Oakland Raiders before walking away from the game.All told, Andre Rison played with an impressive seven different teams during his 12 year NFL career, a fact made somewhat less impressive since his jumping around from team to team likely had a negative impact on his overall production.